MEASURING viscosity at high shear rates is a challenge with conventional instruments, as the instigation of turbulent or unstable fluid flow makes measurements unreliable. The standard way of dealing with this problem is to make multiple measurements, but this requires additional bench time and samples. Rheosense says its new E chip expands the range of viscosity measurements with significantly greater shear rates by eliminating the onset of early turbulence. 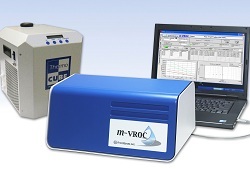 Mounted on the m-VROC viscometer, the E chip measures up to two million reciprocal seconds of water-like viscosity, or one million for typical injket inks (around 4mPas). The E chip’s micro-fabricated flow channel maintain laminar flow at high shear rates, says the company, providing accurate measurements. This viscosity measurement is facilitated by the higher full scale pressure of the chip.